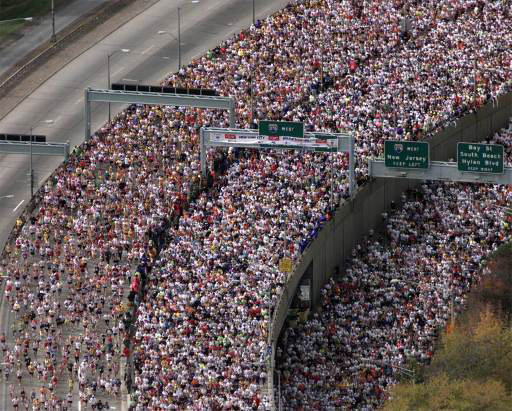 NYC Marathon – one of the great events on the marathon calendar. It is the one marathon that brought running races to the masses and captured the imagination of millions of runners. Only a fool would run through all 5 boroughs of New York City and today there are more than 50.000 ‘fools’ each year! Each one of them has his or her personal story, some run to compete, some to overcome problems, some because they lost a bet, some just to have fun and some to stay healthy. No matter what the cause or motivation – the fact that this person runs is reason enough to be excited! This blog tells the story of Charles-Edouard Catherine. Charles knew he would lose his sight during adolescence. Charles did not allow that to alter his life’s choices. Today Charles trains with Achilles International and his team of guides for the NYC Marathon. As thousands of athletes before, he will soak up the energy from the near endless crowds lining the boroughs of New York. It will be unbelievable experience. Join his journey today and consider making a donation to Achilles International to enable athletes like Charles to participate in sports events across the world.